Natusfera user creating an observation. Since June 2016, anyone who would like to create and share observations of nature, meet other naturalists, or learn about the natural world can sign up for Natusfera, download the app, and start creating their own projects or virtual field notebooks. 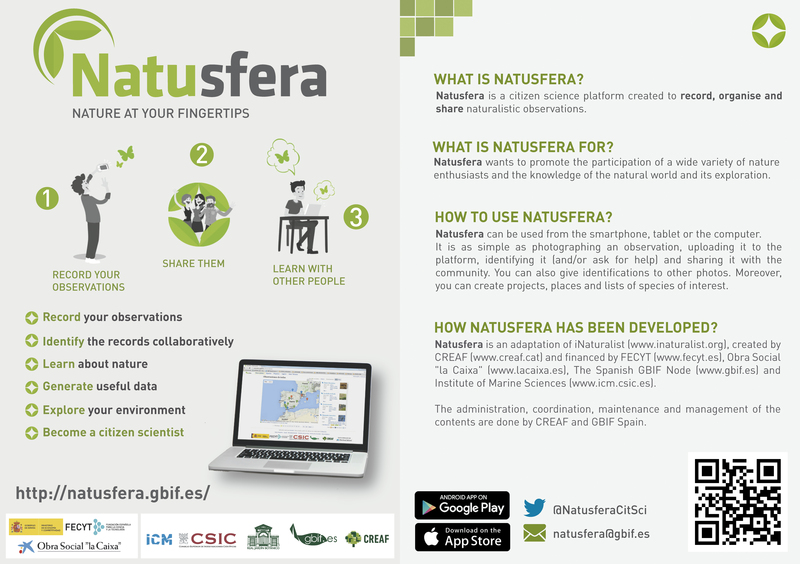 Natusfera, presented in an opening ceremony at the Royal Botanical Garden of the Spanish National Research Council (CSIC by its Spanish acronym), is a citizen science platform created by CREAF and coordinated by the Spanish node of the Global Biodiversity Information Facility (GBIF). The platform is currently available in the Castilian, Galician, Catalan, Basque, and English languages. Its technology has been adapted from iNaturalist, a platform originating from the United States which has been a success there and in Mexico. Natusfera was created with the hope that it will become the foremost citizen science platform for studying biodiversity in Europe. Natusfera is a digital platform, built on open source code and very easy to use, requiring no special technical knowledge. “It is very important that it is within the reach of any anyone, allowing the uploading of photos or even sounds of living beings found in nature; they can be identified, organized, and added to lists or personalized projects. The platform also serves as a virtual network where all of the users are connected and help each other to identify species or to fill in data for multiple projects. 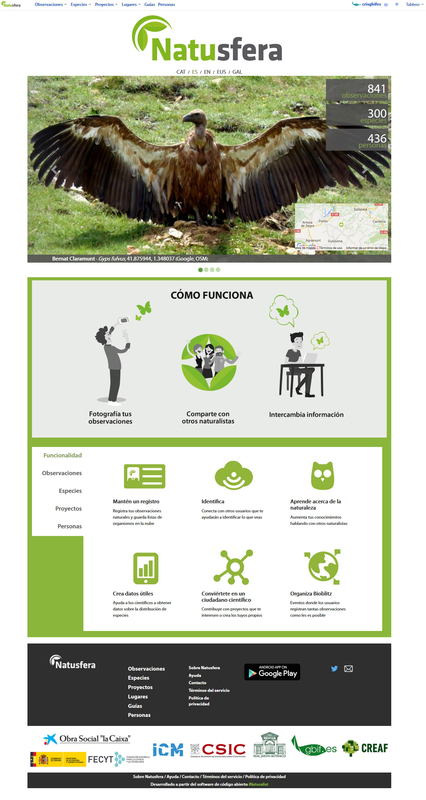 This a very helpful digital tool serving society,” says Jesús Muñoz, director of the Royal Botanical Garden (CSIC, Spain) and head of the Coordination Unit of the National Node for GBIF Spain. A map of observations made in Spain. It is intended that the Big Data generated by users of Natsufera, following validation by experts within the community, will be included in databases connected to the GBIF and therefore be accessible through the organization’s own data portals. The main page of Natusfera. ECSA would like to see Natusfera translated into as many European languages as possible. For this, the collaborative translation platform Crowdin will be used. Also, EU-BON, a large European project whose objective is to create a European biodiversity observation network, has already expressed positive views on the use of Natasfera as a central citizen science platform. The Natasfera platform is financed by the Spanish Foundation for Science and Technology (FECYT by its Spanish acronym), Obra Social “La Caixa”, the National Node for Biodiversity in Spain, GBIF.ES, and ICM-CSIC. CREAF and GBIF.ES are responsible for project administration, coordination, and maintenance and management of contents. Here you can see the Natusfera flyer. You can also download the mobile device application for Android. Adapted from the original text by Anna Ramon (head of Communication of CREAF). This entry was posted in Actualidad de Natusfera and tagged Bernat Claramunt, biodiversidad, biodiversity, ciencia ciudadana, citizen science, ECSA, EU-BON, FECYT, ICM-CSIC, Jaume Piera, Natusfera, Real Jardín Botánico. Bookmark the permalink.